Can I make an attractive pergola canopy as shelter from sun and showers? Questions about a canopy for a pergola. Hello, neat site you got there and very helpful! I’m trying to create a pergola for my balcony. It will mostly be used as a roof/shelter from the sun and rain but I want the roof to be detachable, so I can have it and not when I desire. I guess in order for this to happen, the roof should be created by some kind of cloth that would be able to roll in a coil or something and hide away or roll out and be as a roof. Can u please help me on this? I have no plans, nor do I have the knowledge to build it! I’ll need some help on this. My husband and I are buying a house with a pergola type deck. We are thinking a retracting canvas roof/sides would be awesome. Do you have any plans or know of some we could use for the roof? I am trying to build a pergola with retractable canopy but have problems sourcing a track runner system. Can you help? The existing kits don't quite for the space so I am trying to have it built fitting our measurements. Thank you. 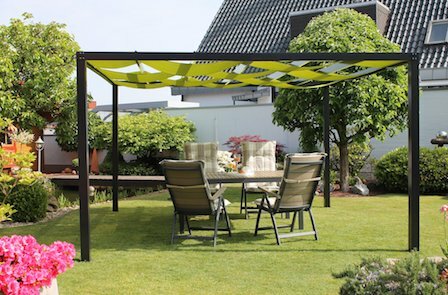 Making a DIY canopy for a pergola using retractable shades. 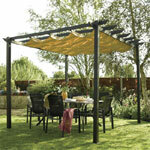 Buying a ready-made canopy pergola kit. What we'll need to do first is source a track runner system to fit underneath the side support rafters. Its important that we're able to attach rigid rods securely to the sliding mechanism carriers that hang below the track. Here are some to give an idea. These particular ones come in a round or rectangular design that is mounted from the top, although we could attach side runners on to the side beams of the pergola as well. We'll need two of these; one for each side. In the picture, the curtains are hanging straight down from the track. 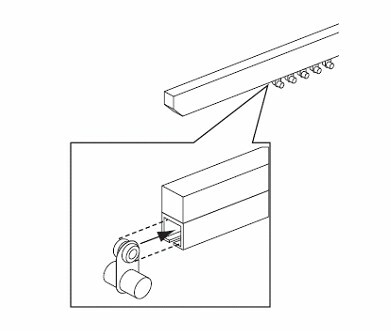 However, for our canopy, we will attach the material to aluminium rods (see diagrams below) and then attach these rods, at right angles, to the tracks by hooking them through the eyes of the button carriers on one side of the pergola to the button carriers on the opposite side. They can also be attached with some sort of hoop or hook if the rod is too big for the carrier. I've chosen these as an example, as they come in various lengths ranging from 140cm (4ft 7") increasing every 20cm to 300cm (9' 10"), although any non-rusting glider system, with button carriers, will do. Of course, you will be able to cut them down to exactly the correct length, if you wish. We will need 4 to 8 rigid rods (depending on the size of our pergola) that will neither bend or rust. These rods are passed through a looped circle that we've stitched into the canvas. The first diagram is the correct way to attach this type of canopy. Notice how the fabric drapes between the poles. Space the materials hoops, through which we'll push the rods, equally along the length of the fabric. Obviously we will need two of these rods at the ends, unless we're having a decorative panel (for example, a scalloped edge, like we sometimes see on blinds) at the ends, hanging down. Measure carefully to make sure the rod holders are equally spaced. This is what our pergola canopy should look like when it is fully extended. Have a look at the pergola kit pictures below to get an idea of how the finished canopy should look. 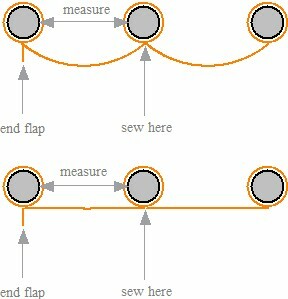 The bottom diagram would stretch the fabric, making it lose its shape over time, and this would certainly happen if rain was left to weigh down the fabric. 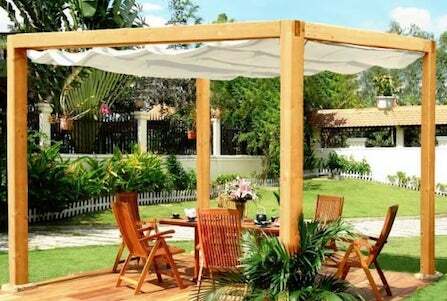 Either use shower-proof material, like the ones used in the pergola kits, or go for a water-proof fabric. However, these canopies are only intended to be a protection against sun and light showers. 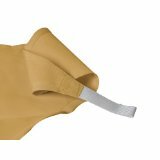 The channels that the drooping fabric creates help to prevent water gathering on the canvas. Water is very heavy and, therefore, it is important to retract the canopy in heavier showers or when it's not in use, in order to prevent any weight of water damaging the canopy and mechanisms. Use Silicone Spray to keep the sliding mechanism gliding freely. These can be very attractive, with a modern, sleek appearance, and act as a very effective canopy for a pergola. 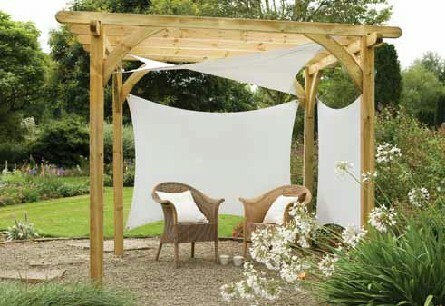 Supplied as pre-manufactured kits, they are a convenient way to add an attractive feature to your garden quickly. Buy the sail with the attachment kit, and you'll be up and running in no time. However, the smallest shade sails tend to be around 3m square. If your pergola is smaller, it's easy enough to make your own. Do make sure that the supporting structure is strong enough to take the tension on the sails. Some shower-proof or waterproof material. You may wish to have fabric that also has UV protection. 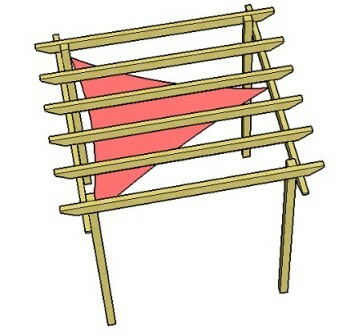 3 or 4 Pad Eyes, depending on whether your shade sail is triangular or rectangular. You will need a strong structure on which to attach these as the tensioning pressure is great. 3 or 4 Snap Hooks that join the metal rings attached to your shade sail to the supporting structure pad eyes. Fixing kits containing all that you need to fix both triangular and square shade sails. 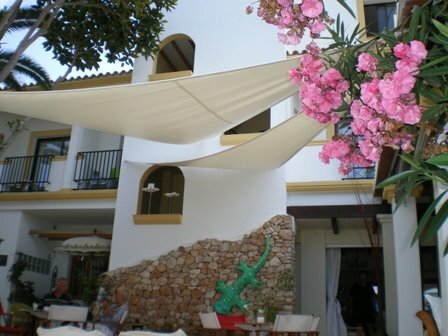 The shade sail must be positioned and tensioned so that there are no low spots where water can pool. This is why the sail is angled at different heights on each corner. The asymmetry is what gives the pergola a modern feel, and also protects the structure from excessive weight and deterioration by the weather. Either use the metal fixing kit mentioned above, or alternatively use a strong hook, and make loops for the hook to pass over. Large or small shades can look really stunning. These are very large ones in an hotel courtyard! When not in use for long periods, you may prefer to take the shade sail down and store it carefully, where nibbling creatures are unable to gain access (they will eat your shade sail if you don't protect it!). Alternatively, leave it up, and if it's tensioned and angled properly, it should last for many years. 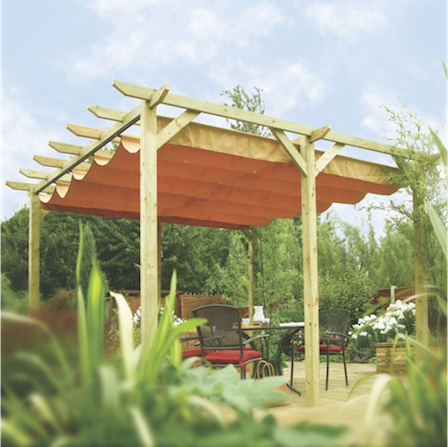 If you'd like all the tricky bits done for you and your space allows it, it might be worth considering a canopy pergola kit. They are available in wood, and there is an aluminium pergola too. Both come in free-standing and attached pergola lean-to designs. As you can see, they create a wonderful place to relax and entertain. 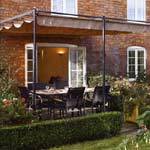 A canopy for a pergola can extend its usability, with protection against sun and light showers. Whichever way you choose to build a canopy for a pergola, I'm sure it will look terrific!